Over the past few decades, the US Postal Service has become increasingly less interested in bringing me my mail. Twenty years ago, in our first house, our letter carrier came up the front walk and pushed the mail through a slot in the door. Ten years ago, in our next house, he/she stopped coming to the door and, instead, left the mail in a box at the end of the driveway. Today, the mail stops half a mile away, in a building at the entrance to our development. I figure it’s just a matter of time before the post office tells me they’ve lost interest entirely, and I should just go pick up the mail directly from the sender. Which is why I was particularly intrigued to learn of the postal service’s newest offering, something which brings my mail much, much closer. It’s called “Informed Delivery,” and it works like this: Each morning, the post office sends you an email with pictures of the snail mail they will be delivering tomorrow. You heard me correctly. They send you a picture of the mail before it comes. Can you open it? No. Can you read it? No. It’s just a picture of the outside of the envelopes. Did the word “idiotic” just pop into your head? Because it sure did when I first heard about this. And so I’ve spent the last couple of weeks gleefully making fun of this new service to anyone who will listen. But you know what? I’m kind of getting hooked on it. I get my Informed Delivery email in the morning, I open it (every time), and I look to see what’s coming that day. Then, when I get home, I go to the little half-mile-away building, open up the box, and wouldn’t you know it, they’re right! It’s all in there. I share this with you today because to me, this is a perfect example of how a company can leverage an existing process in a new and innovative way. In the case of the post office, they’ve been taking pictures of your mail for decades – it’s part of the sorting process. All they’re doing now is taking that same process and letting you peek inside. Sort of like how FedEx lets you track your purchase of Nicolas Cage Bedsheets as they make their way to your house (you didn’t think I knew about that, did you?). So here’s the question for you and me: How can we, as service professionals, do the same? How can we take something that we already do and turn it into a new, repackaged something else that other people would find valuable – either as a free add-on (the way the postal service has done) or as something people might pay for? Do you have forms, templates or checklists that you use with your clients? Could you package those up into an ebook(s) and sell them? Are you a recruiter who has a particular approach to reviewing a resume? Are you a web developer who has a set way of evaluating a web site? What if you created a video of yourself doing that and put it out on YouTube for free, for other people to learn from? Do you conduct a standard assessment at the beginning of each client project? That may have value all by itself. So what if you gave that process a name (I don’t know, something like The Half-Day Evaluation, or The Laser Session Overview), assigned it a price, and sold it as a stand alone offering? For those who take you up on it, you can still waive the assessment fee if they become a client. But if they don’t, they’ve gotten something of value and you’ve earned money along the way. Here’s the bottom line. Cool stuff for its own sake can be a big waste of time. And who knows, maybe the postal service’s latest idea will turn out to be exactly that, once the novelty wears off. Many great business ideas are simply twists on what somebody is already doing. What do you have in place now that might be your next big idea? 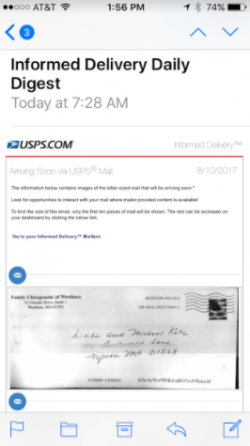 Would you like to see a picture of your mail before it arrives? How about a naked picture of your mail? How about a picture of Nicolas Cage holding a naked picture of your mail? What value-added twists on your service offerings have you put into place? Michael, I loved the article. I have taken your “Creating Email Newsletters for Professional Service Firms” course and several others. It’s just more logical to learn from those that have already worked out the trials and errors instead of struggling for years to attain the same conclusions. Finding what works and duplicating the process instead of wasting time trying to re-invent the wheel makes so much more sense. A new idea on presenting what is already existing lets one repackage work that has already has been created and makes a new marketing item. As a self-employed each day’s walk to the mailbox is an adventure: What checks will arrive today? I just signed up for Informed Delivery so now I’ll know in the morning what checks are arriving each day. Pretty cool, though it will take the excitement out of my mailbox walk each day! I notice you conspicuously avoided mention of looking for those Nicolas Cage sheets, Don. Don’t worry, your secret is safe with me! I enjoy your newsletters when you introduce some new product or service not generally known but it’s unclear how Informed Delivery will help the USPS become profitable (see latest news) – will it increase/encourage the number of people/businesses to send more snail mail (90% of my snail mail is junk anyway)? Doubtful at best. I think businesses would be best to create new products/services that add real value to their customers. Hi Bob! I agree, kind of a sinking ship over there. Apparently, they intend to sell ads in the daily email, but seems like too little, too late in any case. I’ve been subscribed to Informed Delivery and love it. I thought it was brilliant from get go. Now I know whether to watch for mail or take my time. Only downside is that it won’t tell you if you’re getting packages that fit inside the mailbox. Still. Worth. It. I’m glad to know the thrill doesn’t wear off, Meryl! 3. Raising Arizona Nick Cage? Yes!! Wicker Man Cage? Not so much. 4. I’ve created a few checklists and how-tos for video marketing, by repurposing some of my written content and given those to clients and potential clients. I know what you mean about NC. I find him kind of creepy, but I really like a lot of the things he’s done. Matchstick Men was a fave. And I like your #4 examples, too! I LOVE the Informed Delivery idea and I’m going to check it out – thank you! As for Nicholas Cage – he’s kind of, well …vintage. Now 10 years ago, I would have enjoyed seeing a NAKED Nicholas Cage delivering a picture of my mail to my mailbox…ah well. Definitely check it out, Susan. I’ll let you know if NC is available to drop by your house. 4. The serious bit. Yes. I’ve developed 2 workshops, so far. (i) Make Every Email Count – How to use your everyday emails to build your relationships and boost your brand. (ii) Sack the Copywriter – Learn to create your own great web copy. As I refine these, they’ll become e-books and/or webinars I guess. More of the same in the pipeline – workshops/courses/webinars for writing case studies, press releases etc. In theory, most elements of what I do for others will become available as some kind of a course. Long way to go though. Hello Steve! Yes, those two examples are a terrific way to use your content/expertise in other ways. Well done. This was hilarious! I made the mistake of listening to it while I was at work. I work in an “open environment”–about 30 people within earshot of my desk–and I couldn’t help myself, I was laughing out loud! You’ve got me thinking of ways to market something I’m already doing. Thanks again for something very entertaining and very useful! My apologies to your coworkers, Tina. I’m glad it hit the spot and got you thinking too! This is a great article Michael, but an incredibly STUPID service provided by the Post Office. It only saves time for those in wheelchairs who can’t make the trek. Or in a snowstorm when none of the rest of us want to.